LiveCode LessonsLiveCode LessonsHow To - LiveCode Mobile Tasks iOS TasksHow do I Submit an iOS App to the App Store? 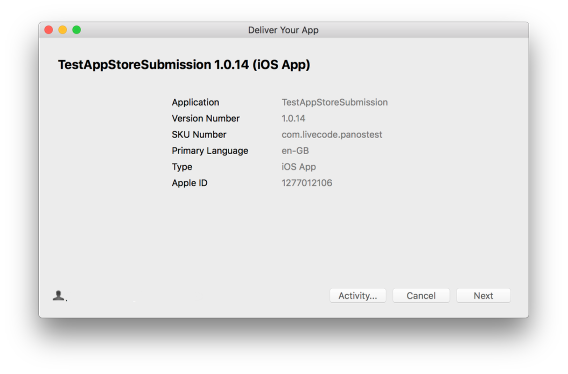 This lesson describes how to submit a LiveCode application to the App Store. Screen captures are provided. 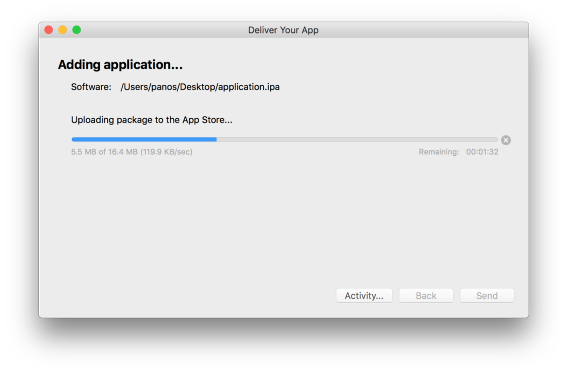 iOS applications can be uploaded to the App Store using the Application Loader that is distributed with Xcode. This lesson describes how to configure LiveCode to build your application for release and use the Application Loader to load your application to the App Store. 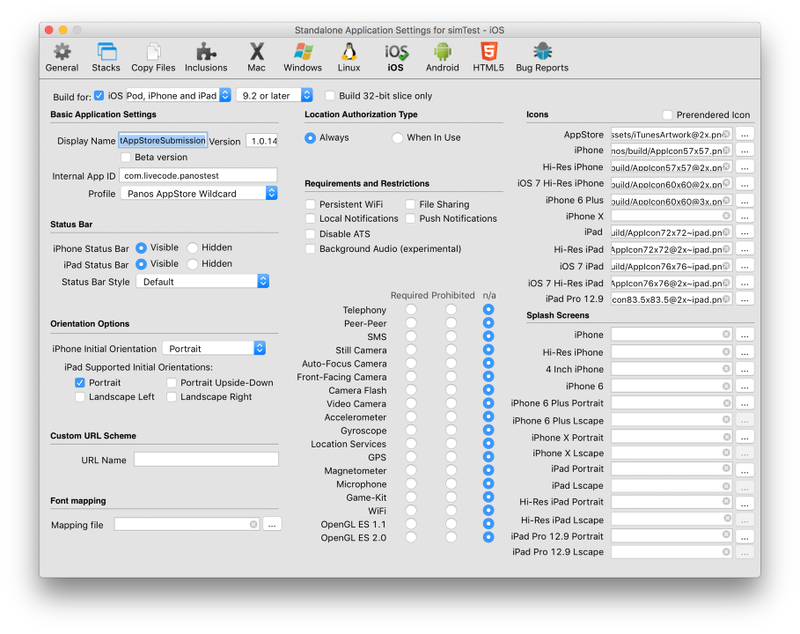 Build your LiveCode application as a standalone and ensure that an Icon and a Splash Screen are provided. You also need to ensure that the Internal App ID matches the one you already set up when you were preparing your application for submission using iTunes Connect. The other settings are very much application dependent and need to be set as required. You need to convert your file to .ipa format and zip it for submission. You can do this by following these steps. 6. Now you can use Application Loader to upload the "application.ipa" file. 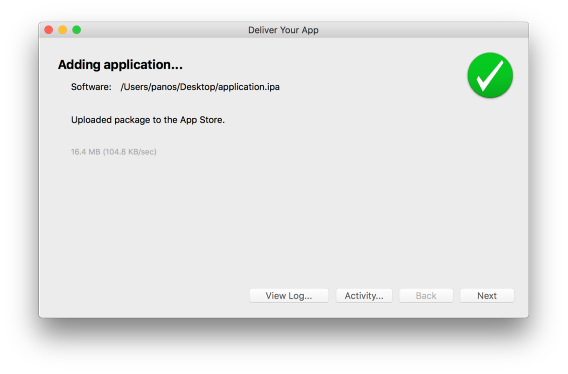 Open Application Loader from Xcode: Click on Xcode -> Open Developer Tool -> Application Loader. 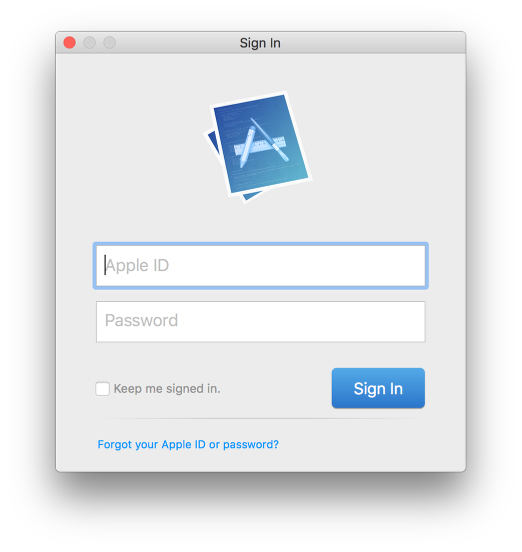 You need your iTunes Connect login information to proceed with the Application Loader. Once you successfully logged into the Application Loader, you can choose the application you prepared for upload. 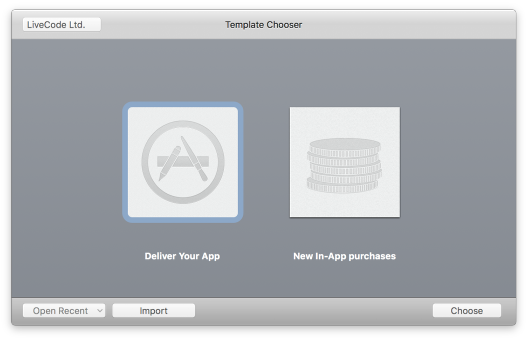 Select Deliver Your App and click on Choose to select the "application.ipa" file you created in the previous step. Note: The Waiting For Upload has to be set in iTunes Connect before you can upload an application. The Application Loader performs some initial test on the file you are uploading and proceeds to upload it if no initial problems are identified. The screen display changes a number of times to indicate at what stage of the assessment and upload the Application Loader is. Once the upload is successful you are prompted with a window, similar to the one shown here. Select Next. If your upload completed successfully, you are presented with the final Application Loader window. Prev: How do I Create a Development Profile for iOS? Next: How do I set up an App for Submission to iTunes Connect? LiveCode does not create a .zip file as mentioned above. You must first compress the standalone created by LiveCode using the File->Compress menu option in the Finder. You cannot use any other compression program, such as Stuffit. This drove me crazy for a good 2 days until I finally sent my problem into Apple and discovered this. If you do not use the Finder compression option to create the .zip, your submission will be rejected as a bad binary file. Application failed code sign verification. The sig was invalid, contains disallowed entitlements, or it was not signed with an iPHone Distribution Certificate. Seems quite a few people are having this issue. Any help on this? there could be a number of reasons for this, but my first guess would be that the wrong Profile is selected in the Standalone Application Settings. Ensure that you have selected the Distribution Certificate that matches the application you are building for release. 2. There is a different between the name I want in the app store and the name I want on the device screen below the icon (after download the app)- so, where do I state that name? you can turn the reflective shine off by selecting the "Prerendered Icon" tick box in the Standalone Application Settings for the iOS app you wish to submit. Use the "Display Name" in the Standalone Application Settings to set the name that appears with the icon. The name in the App Store is probably set in iTunes Connect. Try setting the "App Name". "An error occurred uploading to the iTunes Store"
I previously got a different error saying my certificates and version numbers didnt match, so I am not sure what direction to take in debugging. the steps outlined here are an outline of the actions that are needed to submit an app to the app store, with focus on applications developed in LiveCode. The submission process has many stages to it and it is possible that problems are introduced at any stage. 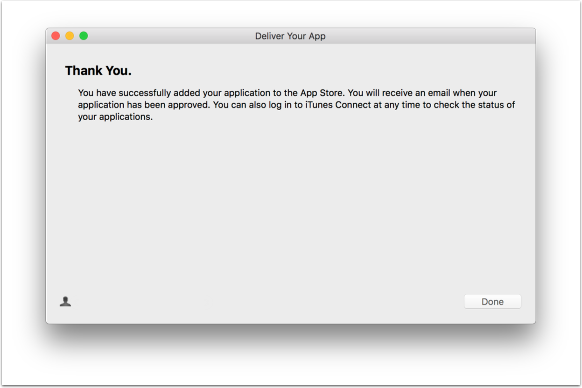 I recommend reviewing the iOS instructions on how to submit applications to the store, as the submission process is regulated by apple. They provide more information on problems that occur and what to do about them. I was on iTunesConnect updating some apps and I notices something. The App Store ICON, the 1024 x 1024 one, is now supposed to be added to the build in xCode. Do we now need a place for this in the iOS standalone settings along with the other ICONs.? So now with xCode 9 do we need to add the App Store ICON to the zip file? I have added a bug report about getting this option added, thanks for bringing this to our attention. We have Apple Developer Enterprise account, Is it possible to distribute the app via App Store? Reading Apple's information, I think you also need a Developer account to submit to the App Store. The Enterprise program seems only to be for in-house distribution. For the definitive answer I would recommend you check in with Apple however. 2. You may need to make a new unique password at appleid: https://appleid.apple.com/ (for screen ratio it was iamp-ilup-eudm-ujyn) you use this log into the application loader. 3. Create a standalone app in LiveCode, note you need to increment the version number (from step 1.) plus build number AND select a distribution profile (not a provisioning profile) previously created on the developer portal - note as well you need a 1024x1024 app icon in addition to all the other assets. 4. Rename the enclosing folder of the app to “Payload”, compress the folder and rename to “application.ipa”. 5. Launch the Application Loader (Xcode -> Open Developer Tool -> Application Loader) - use the unique password from 2. above (think you need to log in with your appleId and password first??). 6. 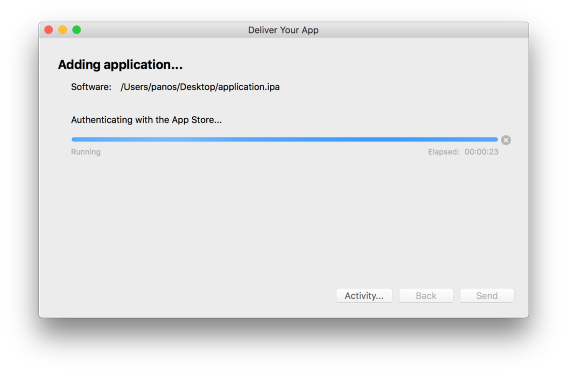 Click “Deliver you app” and choose the application.ipa from step 4. 7. Once uploaded without errors go back to the App Store Connect. 8. The new version will now be available to select from the + button in step 1. on the new version page (about halfway down.